Inky Paws Challenge: Inky Paws #5 Challenge Winners! Inky Paws #5 Challenge Winners! Inky Paws #05 Challenge - WINNERS! We had so much fun checking out all the entries for our fifth Inky Paws Challenge at here at the Newton's Nook Designs blog! We had a so many cool card entries for this challenge! As always- it's hard to pick a winner! Thanks to everyone who played along! It's always so much fun to see what everyone does with our stamps! We love seeing all the projects. Without further ado- here are this months top picks! Since we had over 15 participants we got to pick TWO winners - it was very hard to choose between all the amazing entries but here's what we decided! This card by Elena is our first winner this month! 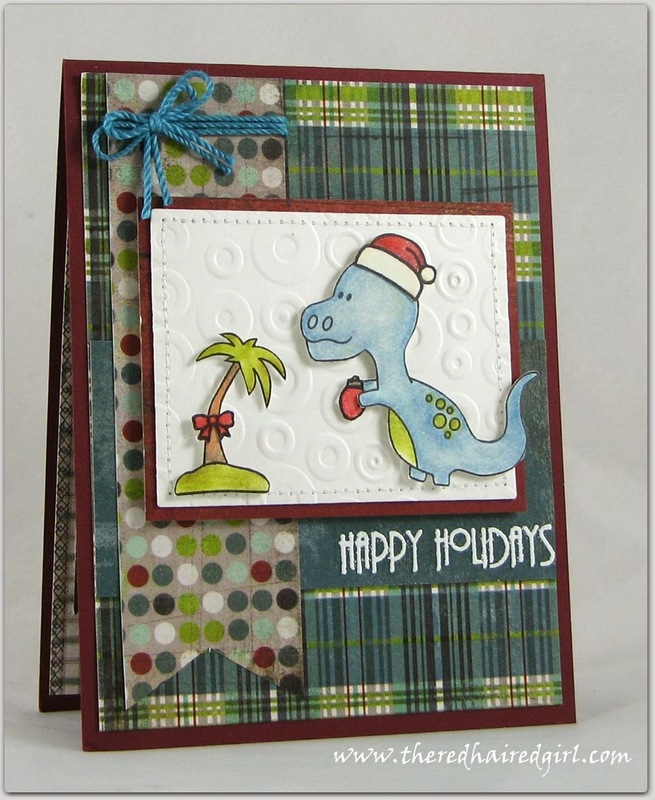 This card made me smile right away- She used our Prehistoric Pals set to create a really fun christmas scene! She added a santa hat on the dinosaur and a bow on the palm tree - and look, the dino is on his way to adding on a christmas light! Such a cute idea! Our second winner is Donna with this fun Mitten Card. Donna used the free digital mitten stamp from our freebies page here. We thought it was really cool how she separated the mitten from the sentiment on her card. Also, we liked her clean white layout with pops of red and teal! So cute! Congrats Elena and Donna! Don't forget to send me an e-mail at info@newtonsnookdesigns.com to claim your $10 store credit and get your winner badge for your blog! Since there were so many beautiful cards, we chose two more as our favorite picks! If you see your card below, contact us if you'd like to get a "favorite" badge for your blog! This card by Indy is super sweet! We love the monochromatic soft blues and gray and the little pearls on the hat and scarf! 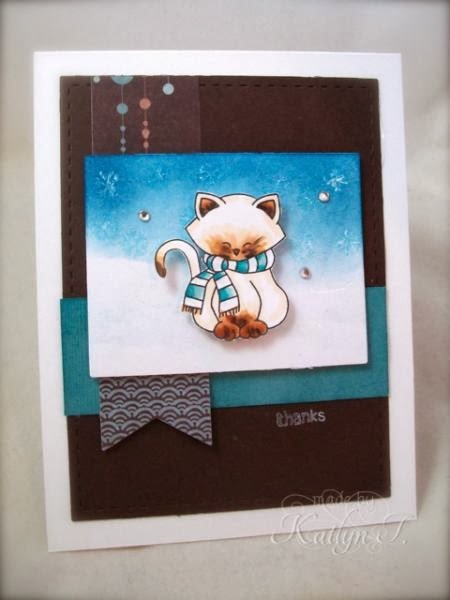 This card uses our Snow Day Stamp set. We loved the coloring of the kitty on this card by Katlyn! What a gorgeous card using our Newton's Holiday Mischief set! Thanks again to everyone who entered - We LOVE seeing all the entries! It's seeing what you create with our stamps that makes all the work we put into our business worthwhile! If you didn't win this time we hope you'll try again next month. It's always SO HARD to pick the winners because everyone does such a great job! We will be doing another challenge in January!